A national company with 50 branch offices established a quarterly sales recognition program designed to reward individuals who met certain sales milestones. Each representative received a Renton Goal-Setter and added one block for each quarter that the sales quota was met or exceeded. 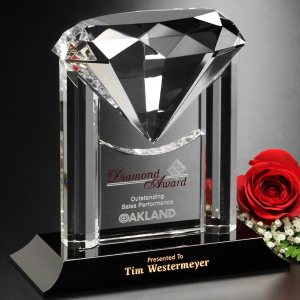 The details of their recognition program are explained here in more detail. The company that implemented this quarterly sales award program used its internal marketing channels with boldness in order to keep lines of communication open between the managers and their salespeople. Weekly meetings kept salespeople in the know regarding key sales metrics like the number of new customer acquisitions, increases in the number of orders from existing customers, and any increases in margins worth noting. On a quarterly basis, a sales event was organized for each branch by the manager of that branch. The event was meant to build community and foster continued engagement in the sales program. At these quarterly celebrations, employees received their Goal Setter Award and corresponding block to commemorate their newest milestones. The results of this program were notable – an 8% increase in sales over their first quarter goal and sales representatives responded positively to the program and became engaged participants. However, most importantly, the crystal Goal-Setter became a symbol that garnered the pride of the salespeople participating in this program. 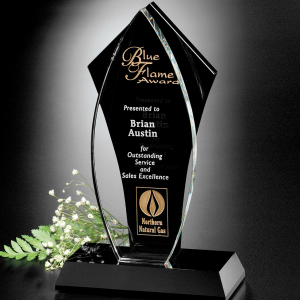 The award became a symbol of excellence and professionalism within the culture of this company. Programs like this are part of the corporate landscape throughout the business world today. If your company is not operating a recognition program that stimulates sales growth, you are missing out on a program that can truly make a difference. 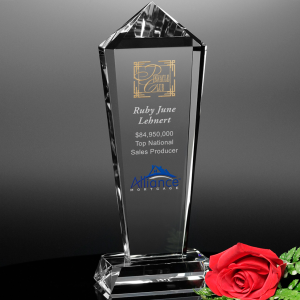 Take a look at these exciting sales award ideas!